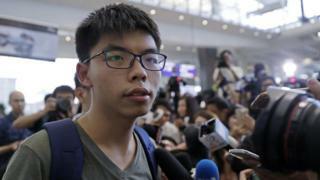 Hong Kong pro-democracy activist Joshua Wong has been barred from entering Thailand and deported. Mr Wong, who became the face of the 2014 Hong Kong street protests, had been hoping to speak to Thai students. But the 19-year-old was detained on arrival at Suvarnabhumi airport and then flown back to Hong Kong. He said there had been "no explanation for his detention", but activists attributed the decision to intervention from Beijing. Mr Wong was at the heart of the mass demonstrations against Beijing that brought parts of Hong Kong to a standstill in late 2014. The protesters were calling for free elections for Hong Kong's leadership. The protests failed to achieve their goal, but several of their leaders have since entered politics. Mr Wong had been invited by Thai student activist Netiwit Chotipatpaisal to address students at Chulalongkorn University to mark the 40th anniversary of a massacre of students in 1976. Mr Netiwit had told the South China Morning Post newspaper ahead of the visit that it could inspire Thai students to speak against the military leadership. But when he arrived in Bangkok in the early hours of Wednesday, Mr Wong was detained. "They forced me to stay inside the police station and stay in prison for 12 hours," Mr Wong said at a news conference back in Hong Kong. "When I asked what's the reason for them to detain me at Bangkok, they just say that 'we will not give any explanation'." Thailand's military leaders, in power since a 2014 coup, denied any role in the detention. But Mr Netiwit said on Facebook that police told him they had received a letter from China regarding the visit, without providing proof of his claim. The Nation newspaper also quoted an immigration official as saying a request to blacklist Joshua Wong came from China. Nathan Law, a fellow Hong Kong protest leader who has since been elected to parliament, told local radio Beijing was worried Mr Wong "would bring (his) influence to other countries". Hong Kong authorities said they had asked Thailand to respect Mr Wong's rights. China's foreign ministry, meanwhile, said it respected Thailand's immigration control. Rights groups condemned the move. Amnesty International said it underscored government willingness to suppress freedom of expression and raised serious concerns "about how China is using its influence over Thai authorities". Last May, Mr Wong was denied entry to Malaysia where he had been set to take part in talks about democracy in China. In recent years, Thailand has faced criticism for its co-operation with Beijing. Last year, Hong Kong publisher Gui Minhai disappeared while on holiday in Thailand. He later appeared on Chinese state TV, saying he had voluntarily handed himself over to the authorities over a drink-driving fatality years ago. There was widespread speculation that he had been deported to China at Beijing's request because of his involvement with a publishing house which published material critical of China's leaders. The UN condemned Thailand last year for deporting two Chinese dissidents it had given refugee status. The men had been in detention for illegal entry and rights group believe they were returned to China.